So I did it, I finally gave in. It's one of those undeniable literary sensations that people can't seem to get enough of, invoking similar reactions to The Da Vinci Code and infused with it's own Potter-mania like enthusiasm from fans and doesn't seem to have too many detractors; or at least not too many detractors who have very much funding to make their opinions known. In all honesty, I'm ready to add to the hype. The Girl With The Dragon Tattoo might not be a literary revelation, but it is engrossing, fully-formed and, towards the end, a page-turner. 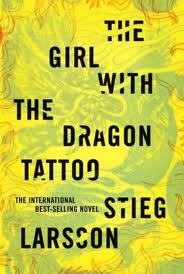 When I bought the first installment of Stieg Larsson's Millennium Trilogy at the Strand so many months ago, I had certainly heard of it before; in fact, I thought I was probably behind the curve and purchasing it in its twilight stage of readerdom. What I didn't know was that the original Swedish film trilogy was about to be released, David Fincher was itching to get his hands on the Hollywood version and that virtually every beach-going vacationer who passed a literacy quiz would stuff this into their beach bags. As with most books that become phenomena, I'm not certain that there's any one aspect that people can point to as the singular reason that people want to read the work; the reason it's a phenomena is that it appeals to a massive number of people, across all walks of life, each with their own reasons. At its heart, The Girl With The Dragon Tattoo is a murder mystery, with enough of a love story to keep me wondering whether I should buy the next installment on Amazon, or just go straight to the bookstore. The good news is that it's more in the vein of Agatha Christie than James Patterson (only mild offense meant to James Patterson fans). The Sweden it exists in, and the characters who inhabit that Sweden seem almost fully formed. I couldn't help feeling that there were certain parts where the translation into English somewhat hindered the flow of the prose, but, for the most part, especially when the reveal comes, I couldn't read quickly enough. One slight item to bring up is that the characters seem so fully formed that, at times, I was almost slightly confused. It was as if I would have been needing to live inside of Larsson's mind to make immediate sense of everything, but re-reading a sentence never hurt anyone, and if you're like me, you'll start to be well and truly thankful for the small Vanger family tree that is provided at the end of the prologue. In all honesty there are a lot of Vangers who do a lot of (very bad) things and it takes some clear thinking to keep track of it all. While there were moments that felt a little as if I was watching an episode of Poirot, Christie is almost light-hearted banter in comparison to the dark places that Larsson treads. I had seen the movie beforehand, so fortunately or unfortunately, I knew what was coming, but I certainly didn't know everything. There's a level of contempt for humanity that the movie doesn't seem to capture that the heroine, Lisbeth Salander, seems to only be able to convey on the page. It's clear that Larsson seems to identify easily with Blomkvist, the hero. Despite the fact that the character blunders at times, there's an easiness, a feeling that his lines didn't have to be rewritten too many times. There seems to be more effort having to be put in to Salander, who appears to be rendered as an exact opposite of the Blomkvist image. Their only similiarity is that they're both extremely resourceful and inexplicably drawn to each other. I didn't really feel as if the surface of Salander had been more than scratched, and perhaps that's where the other two novels of the trilogy may succeed. The chapters I found most engaging were as Salander, without the restraints of emotion, was left free to render her own version of fair in a world where, well as we've all been told, fairness doesn't matter. Her vigilante-style resolutions made me cheer in a very deep, dark place that rarely exists, except when I'm thinking to myself scenarios that begin with the phrase "If only...". The novel works, not only because it's a good base for a triology, building in a promise to the audience that more information and adventure will follow, but because through these characters, there's a release. The worst of humanity may be exposed, but, as a novel is a perfect world, there's always someone to pull us back from the edge. In all honesty, I probably wouldn't mind being pulled back from the edge by Mikael Blomkvist who, may not wear armour, but who, I'm almost certain, would drive a white Volvo.